Lifting the curtain on London’s fringe theatres. Just a five-minute stroll from Earls Court Underground Station, and situated on Finborough Road is the small but perfectly formed Finborough Theatre. Specialising in thought provoking new writing and musical theatre, whilst regularly dusting off previously neglected works from the 19th and 20th centuries, the Finborough has been steadily gaining momentum for the last 30 years and consistently punches well above its theatrical weight. In the last couple of months alone, the Finborough has collected a brace of well deserved awards; most recently being The Stage 100’s Fringe Theatre of the Year award in recognition of outstanding achievement in UK theatre. To mark its 30th anniversary last year, the Finborough celebrated with a season of 44 premieres of new plays and musicals. Not bad for a completely unfunded, tiny 50-seat theatre, situated above a wine bar. The Finborough’s ascent to becoming a leading light in London theatre has been orchestrated in recent years by Neil McPherson, who became Artistic Director in 1999, and he's ensured that the theatre’s output and level of excellence is on a par with much larger subsidised theatres. Behind the scenes the theatre works tirelessly to discover and nurture practitioners of the future through a variety of internship and Director programmes, which also includes a partnership with the National Theatre Studio. The current production is the first London outing in just under 40 years of Graham Greene’s The Potting Shed, which runs until the 29th January. 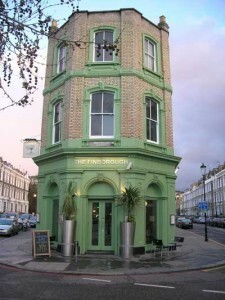 The Finborough Theatre is at 118 Finborough Rd SW10 9ED. Take a trip round other London Fringe Theatres.